The Cressi Maya Ladies 7 mm full one piece, rear zip wetsuit, all-in-one for temperate waters, hoodless, with long sleeves and pants, made from double lined 7 mm thick neoprene. To reduce water infiltration, the strong rear YKK zipper has an Aqua stop under zip. The neck is watertight thanks to a single-lined neoprene seal. The seals at wrists and ankles have a zipper to make it easy to put on and take off. The legs are preformed to guarantee easier kicking movement. 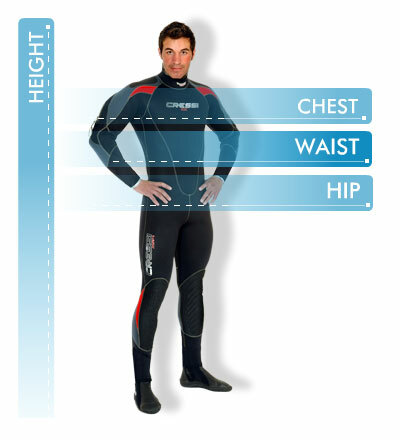 Cressi NeoPro-fit design to ensure a superior fit. NeoPro-fit combines superior erosion resistance and durability with elasticity and softness. Also, guarantees a better relationship between performance and affordability. The durable nylon 7mm neoprene rubber has lilac thread sewn seams for strength, durability and a touch of style. Suit has a back zipper closure with pull tab leash for easy self donning and doffing with a neck closure for a custom fit. To reduce water infiltration, the strong rear YKK zipper has an Aqua stop under zip. The neck is watertight thanks to a single-lined neoprene seal. The legs are preformed to guarantee easier kicking movement. The suit is black in colour, and available in multiple sizes. Available in female sizes 1 to 5.